Gurudwara Fatehgarh Sahib is a complex consisting of several important shrines or Gurudwaras linked to the younger sahibzadas (younger sons) of Guru Gobind Singh. It is located about 5 km north of Sirhind, 40 Km from Chandigarh and marks the sad site of the execution in 1705 of the two younger sons of the tenth Sikh master at the behest of Wazir Khan of Kunjpura, the faujdar of Sirhind. The main entrance to the Gurudwara complex was built by Maharaja Yadvindra Singh of Patiala in 1952. The historical wall where the younger sons of Guru Gobind Singh were bricked has been preserved in this Gurudwara. The sanctuary containing the historic wall in known as Gurudwara Bhora Sahib. Gurudwara Burj Mata Gujri and Gurudwara Shahid Ganj are also located in the main complex of Gurudwara Fatehgarh Sahib. It was at the site of Gurudwara Burj Mata Gujri that the two younger sons Fateh Singh and Zorawar Singh of tenth Guru and the Guru's mother Mata Gujri were kept in confinement by Wazir Khan. The place were the three were confined is known as `THANDA BURJ' which was considered a cool place during the summer. But it was a punishment for Guru's sons and his mother to kept here in extreme winter when the "burj" would be extreme cold. It was at this place that Mata Gujri collapsed on hearing the news of the martyrdom of her grandsons. Later on, Gurudwara Mata Gujri was constructed at this location to honour Mata ji. Gurudwara Jyoti Sarup : This Gurudwara is about 1 Km from Fatehgarh Sahib on Sirhind- Chandigarh road. It was at this place that the mortal remains of Mata Gujri, the mother of Guru Gobind and his two younger sons, Fateh Singh and Zorawar Singh were cremated. It is believed that Wazir Khan, the then Faujdar of Sirhind refused to allow the cremation of the bodies unless the land for the cremation was purchased by laying gold coins on it. Seth Todar Mal who was an ardent devotee of Guru Gobind Singh, purchased this place of land by offering gold coins as demanded. 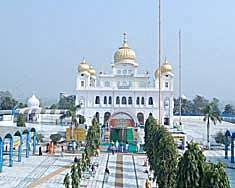 Gurudwara Shaheed Ganj : It is situated just half a kilometer from Gurudwara Fatehgarh Sahib. It commemorates the martyrdom of those Sikhs who were killed by the tyrannical Mughals. It is believed that forty cartloads of heads of martyred Sikhs, were cremated. Shahidi Jorh Mela : There are certain events which leave an indelible mark on the minds of the people for ever. Saka Sirhind is one of such historical event. 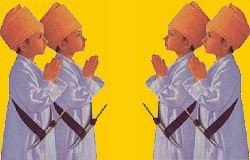 The martyrdom of two younger sons of Guru Gobind Singh is unique in the annals of world history. The barbarous incident of bricking the two sons alive for refusing to embrace Islam took place on December 25, 1704. To commemorate the event, Shaheedi Jorh Mela is held every year at Fatehgarh Sahib from December 25th to 28th. Palki Sahib : On the first day of the Shahidi Jorh Mela exhibits of various government agencies are put on display. Another important feature of the Jor Mela is the sound and light programme organized by the Public Relations Deptt. of the state. It is a two hour light and sound programme held at the Aam Khas Bagh, Sirhind which showcases the history of Sirhind. The second day of the Jorh Mela is dominated by religio-political conferences of the various political parties of the state. The third day of the Jorh Mela is highlighted by the Nagar kirtan. The holy Guru Granth Sahib is put in a beautiful Palki placed in a well decorated special bus and carried in a procession. The procession starts from the main Gurudwara Fatehgarh Sahib and terminates at Gurudwara Jyoti Sarup, where the Sahbizadas were cremated. This procession is symbolic of the actual cremation procession of the Sahibzadas and their grand mother. Day 1. Early morning drive for Fatehgarh Sahib, reach Gurudwara Fatehgarh Sahib in the afternoon, Darshan of Fateh Garh Sahib, Gurudwara Burj Mata Gujri, Gurudwara Jyoti Sarup and Gurudwara Shaheed Ganj, evening drive for chandigarh, night at chandigarh hotel. Day 2. Breakfast, morning drive for Anandpur Sahib, Darshan of Takht Sri Anandpur Sahib and Gurudwaras around Anandpur Sahib, afternoon drive back to Delhi, reach Delhi late evening. * Delhi to Fatehgarh Sahib same day Tour.